Eye On Tampa Bay: How bad is Tampa's air? As we at The Eye get around town, going to a bunch of meetings on the local transportation issues, we keep hearing from Sierra Club representatives how bad Tampa's air quality is. Just how bad is it? "The worst in the state." We're not the only ones who have asked this question. In 2012, local TV station WTSP looked into the issue. 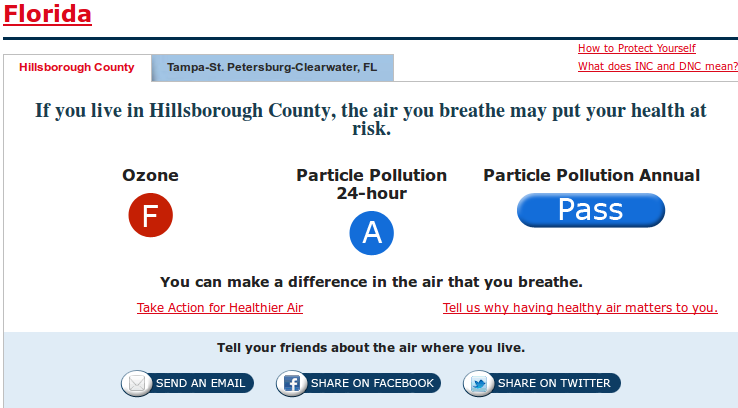 TAMPA, Fla. - The American Lung Association recently gave Hillsborough County an “F” for ozone pollution. Some environmentalists claim Tampa's air is the worst in Florida, and could contribute to respiratory problems among children, the elderly, and those with heart and lung conditions. The I-Team looked into the air we breathe and the major contributors to pollution in Tampa. "It's the worst. We have the worst air quality," said Phil Compton of the Sierra Club Florida. In a review of the Florida Department of Environmental Protection’s 2011 Air Monitoring Report, the I-Team found Hillsborough County had 12 days in 2010 in which the air was deemed “unhealthy for sensitive groups”. That’s more than any other county in Florida. Pasco and Pinellas counties, by contrast, had 0 days of unhealthy air. Polk County had 1. 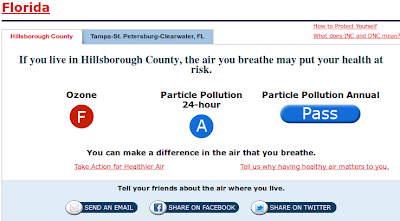 Well, in fact, the American Lung Association has cited Tampa as an F when it comes to Ozone pollution. 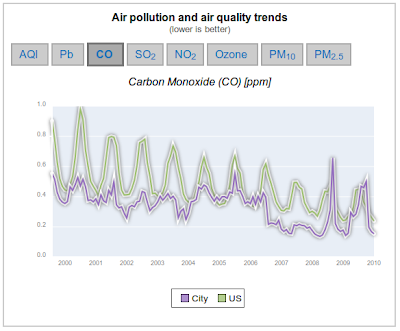 According the American Lung Association, we've had 13.5 fewer Ozone alert days since 1996. The trend is clearly heading in the right direction, as we are borderline F.
We've had 12 "Ozone Orange Days" in 2013, which may be troublesome for some sensitive populations. Note, the American Lung Association gives a A for particle pollution, and again, the trend is downward, in the right direction. So what about other pollutants and trends? 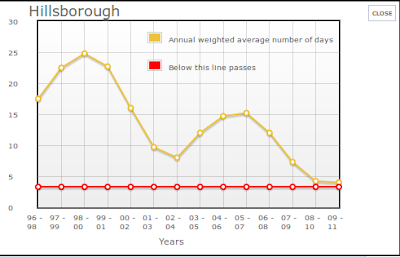 According to City-Data (scroll down a bit), not bad at all. 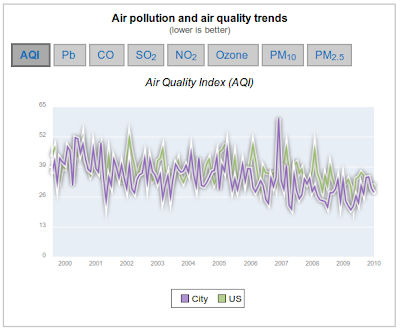 The overall Air Quality Index for Tampa is 26.3, better than the US average of 32. Of the 8 common air pollution measures, Tampa, 5 are better or significantly better than average, 2 are about average, and 1 (lead) is significantly worse than average. 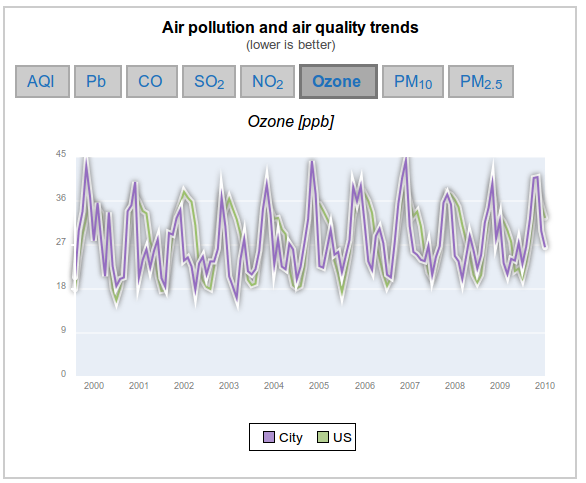 It's interesting that ozone level as measured (2010) was about average. Compare that to the American Lung Association. In 2010, Pb [lead] monitors recorded seven exceedences of the standard, each at the CSX Rail Yard air monitoring site located on the southern boundary of a lead-acid batter recycling plant. Fortunately, this facility is currently undergoing major reconstruction to full enclose the lead processing operations, upgrade emission controls that will reduce the emissions from lead in to the atmosphere. I encourage you to go to City Data and review and play around with the data yourself. Larry George of the Air Resource Division of the Florida Department of Environmental Protection says his agency’s own numbers from that report may be skewed. He believes Hillsborough County had fewer than 12 days of unhealthy air, but the number appears higher because one of the air quality monitors is in close proximity to a Mosaic fertilizer facility. I guess they had trouble climbing up the smoke stack. 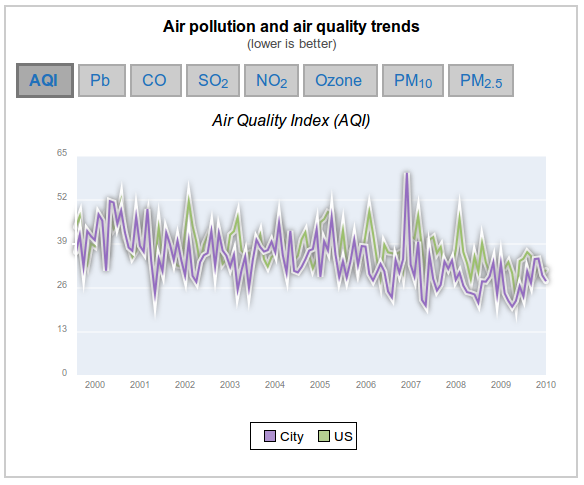 Tampa is not one of the most polluted cities in country. In fact, Tampa makes an appearance as one of the cleanest cities in the country. As the engine technology in automobiles and trucks improve, the peak levels of ambient concentrations of CO [carbon monoxide] have dropped. This also holds true for nitrous oxides and ozone, which are also pollutants emitted from internal combustion engines, although its interesting the decrease in measured ozone is stable compared to CO and NO2. 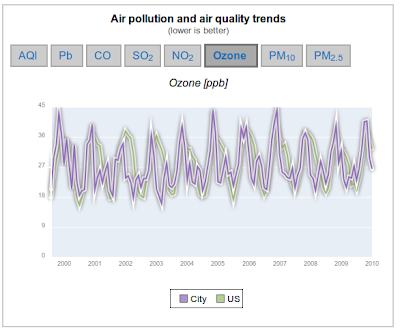 I would expect ozone to be on a similar trend as CO and NO2, but it is rather stable, yet the American Lung Association does show a downward trend. Pinellas and Miami-Dade grade better than Hillsborough despite their higher population densities. Perhaps there is a local climate explanation. In 2010, Hillsborough County experienced seven days when the AQI reached the range for "Unhealthy for Sensitive Groups". There were two days when the maximum 8-hour concentration [of ozone] exceeded the NAAQS of 75 ppb. Again, the data supports the trends are heading in the right direction, and will likely continue in in the right direction as even more fuel efficient vehicles hit the roads. Tampa/Hillsborough air pollution is not a crisis.